Heat oven to 375°F (350°F for Grands!™ crescents). Line large cookie sheet with cooking parchment paper. In 10-inch nonstick skillet, cook bacon over medium heat about 4 minutes or until cooked but not crisp, turning once. (It will continue to cook in oven.) Set bacon aside; drain all except 2 teaspoons bacon drippings from skillet. In medium bowl, beat 1/3 cup of the milk, the eggs, salt and pepper with fork or whisk until well mixed. Stir in bell pepper. Pour egg mixture into skillet. As mixture heats, portions of eggs will begin to set. Gently push cooked portions with metal spatula to outside edge of skillet. Avoid stirring constantly. As more egg sets, push it to edge, and place it on top of the already set egg mixture. Cook 2 to 3 minutes or until eggs are thickened throughout but still moist. Meanwhile, unroll dough; separate into 8 triangles. 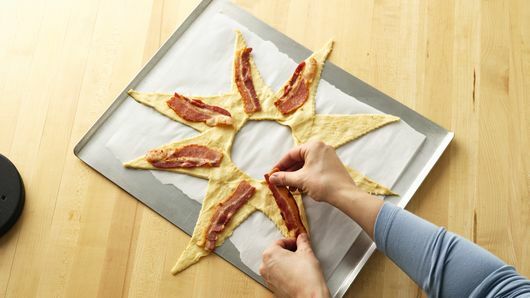 On parchment-lined cookie sheet, arrange triangles with shortest sides toward center, overlapping in star shape and leaving 4-inch round circle open in center (see diagram). Crescent dough points may hang over edge of cookie sheet. Press overlapping dough to flatten. Bake 20 to 25 minutes (18 to 23 minutes for Grands!™ crescents) or until deep golden brown. Cool 5 minutes. With broad spatula, carefully loosen ring from cookie sheet; slide onto serving platter. Garnish with cilantro and salsa. If you prefer, or if you can’t find the Mexican cheese blend, make your own. Mix 1/2 cup each shredded mozzarella, shredded provolone, shredded Cheddar and grated Parmesan cheeses. Garnish each serving with chopped tomato, cilantro, green onions, sour cream or salsa. Tip: Bacon grease is a mess. For easy cleanup, carefully pour it into a “bowl” made of foil, then fold in edges and toss once grease has cooled. More smart foil tips. Pillsbury™ Grands!™ crescent dinner rolls come in Big & Buttery and Big & Flaky flavors; be sure to adjust temperature and time as indicated to prevent overbrowning. If you’re looking for a brunch show-stopper you’ve come to the right place. 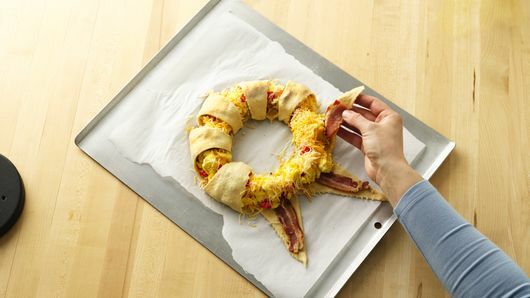 This fabulous breakfast crescent ring is way simpler to make than it appears thanks to our handy crescent rolls and a few hearty ingredients. Plus, it’s super fun to make, and even more fun to eat! 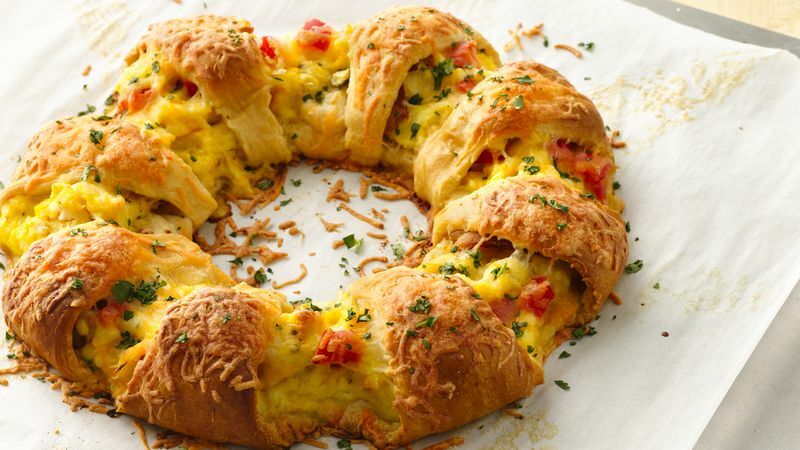 We like to share this recipe on occasions like birthday breakfasts, Christmas morning, or Easter brunch. It’s guaranteed to get the oohs and ahhs those special days deserve! And if you’re hosting, we have lots more breakfast and brunch recipes to complete the meal, like pancakes, waffles and more.